Putting rabbits and guinea pigs together is something that many people have tried in the past to do. 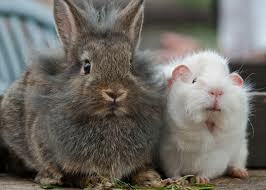 So can rabbits and guinea pigs live together? Lets look at this further. Rabbits and guinea pigs are both very sociable animals and both prefer to be around the company of others as opposed to being on their own. They are both of a similar size and share a similar size of living space so you would think they would be a good fit to share a living space together. However, upon investigation I discovered that having they share the same dwelling is actually something to be discouraged. I realised that it is not a good idea for them to live together and there are a some good reasons for this. Although they are creatures that both love to eat hay all day as well as good amounts of vegetables, they have different diets to each other and need different nutrients in their foods to the other. A rabbit could also very easily hurt a guinea pig if they were to get angry. With their very powerful hind legs they possess quite a heavy kick which can be very painful if it connects to a guinea pig. This could also very easily happen by accident especially if the rabbit is leaping about a cage. They could also bite a guinea pig either purposely or by accident. Rabbits are also very good at burrowing and could very easily get out of a cage that isn’t well rabbit-proofed. If the rabbit goes, the guinea pig will follow. The way a rabbit behaves and a guinea pig behaves is very different. They both have different ways of behaving which will cause stress and conflict with each other because they are unable to understand each other. However, that’s not to say it can’t work at all. There have been owners who have been able to make this work when they have a rabbit and a guinea pig amenable enough to get along with each other in the same cage or hutch. There are some things to bare in mind if you do try and make this happen. Make sure they both have an area they can retreat to get away from each other. Make sure that they are both neutered. Make sure that their food is kept in different areas and that they are fed the appropriate diet for their needs.